Originating in France in the 18th century, the game of Charades evolved from a riddle-based game where participants described the individual syllables of a word and it’s full definition for others to solve. 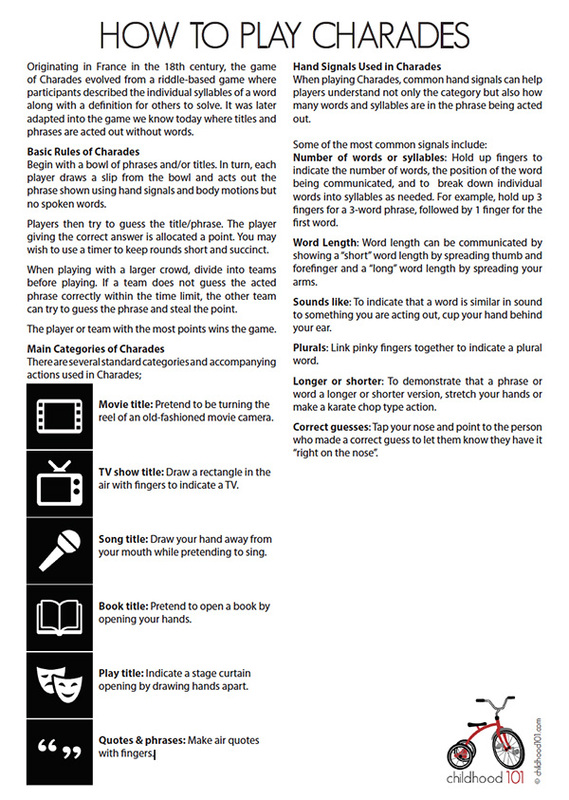 It was later adapted into the game we know today – where phrases and titles are acted out without words. Charades is a fun game to play at parties, with youth groups or with your family as you gather together for the holidays or family game night. If it’s been a while since your last game of Charades, or you’ve not played before, you’ll find a handy printable How to Play Charades game sheet below. 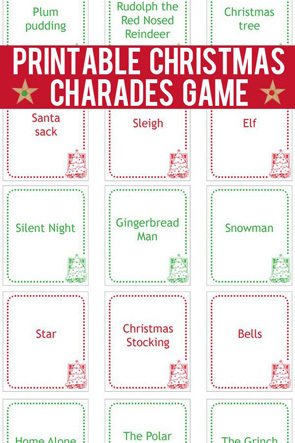 And if you’re keen to get playing, check out our Charades games cards – we have Christmas Charades, Fairytale Charades and Family Movie Charades available as free, printable game card sets. Begin with a bowl of phrases and/or titles. In turn, each player draws a slip from the bowl and acts out the phrase shown using hand signals and body motions but no spoken words. Players then try to guess the title/phrase. The player giving the correct answer is allocated a point. You may wish to use a timer to keep rounds short and succinct. When playing with a larger crowd, divide into teams before playing. If a team does not guess the acted phrase correctly within the time limit, the other team can try to guess the phrase and steal the point. Movie title: Pretend to be turning the reel of an old-fashioned movie camera . TV show title: Draw a rectangle in the air with fingers to indicate a TV. Song title: Draw your hand away from your mouth while pretending to sing. Book title: Pretend to open a book by opening your hands. Play title: Indicate a stage curtain opening by drawing hands apart. Quotes & phrases: Make air quotes with fingers. When playing Charades, common hand signals can help players understand not only the category but also how many words and syllables are in the phrase being acted out. Number of words or syllables: Hold up fingers to indicate the number of words, the position of the word being communicated, and to break down individual words into syllables as needed. For example, hold up 3 fingers for a 3-word phrase, followed by 1 finger for the first word. Word Length: Word length can be communicated by showing a “short” word length by spreading thumb and forefinger and a “long” word length by spreading your arms. Sounds like: To indicate that a word is similar in sound to something you are acting out, cup your hand behind your ear. Plurals: Link pinky fingers together to indicate a plural word. Longer or shorter: To demonstrate that a phrase or word a longer or shorter version, stretch your hands or make a karate chop type action. Correct guess: Tap your nose and point to the person who made a correct guess to let them know they have it “right on the nose”. Click here to download: How to Play Charades Instructions. Save the PDF to your own computer. Open the PDF and print the page you require. When printing, select “Fit to printable area” (or similar) to ensure the page fits with your printer type and local paper size (these have been created at A4 size).